I have really enjoyed getting back into sewing for myself over the past few months. Having initially discovered the world of PDF patterns through the amazing Leesa when I signed up for Craft Boxes nearly a year ago, the boxes led me to discover various facebook pattern groups and I now find myself gathering up a growing pile of patterns and fabrics. We're supposedly into Spring here in Australia and despite some very wet, chilly days, I've been inspired to make some bright and pretties ready to wear over the coming months. Out September CraftBox included some gorgeous floral fabric and a pattern for the Make It Perfect A+ Skirt. I decided to line this one and am so happy with the result. I plan to wear this outfit later this week as I attend a High Tea to mark the start of Mental Health Month. When I saw this cute, colourful house door fabric recently on the Tesutti site, I knew it would work in the same pattern. I decided to straighten the side seams on this one as it suited the fabric and print better. I received so many comments when I wore this outfit to church yesterday. So many colour options to pair with this skirt! The skirt is a quick sew, I made both skirts and one pair of the leggings in one day! 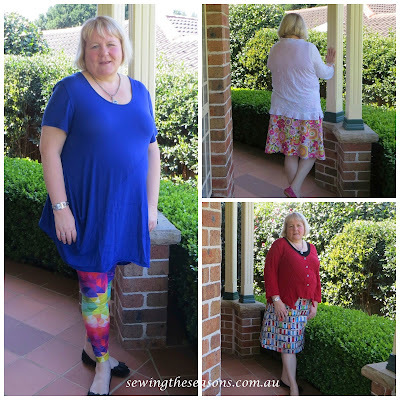 I have also become slightly addicted to leggings, such a quick, easy sew. The pattern that best suits me is another one from the wonderful Kymmy of EYMM, the Active Wear leggings. Cut out, sew to finish is well under one hour per pair! 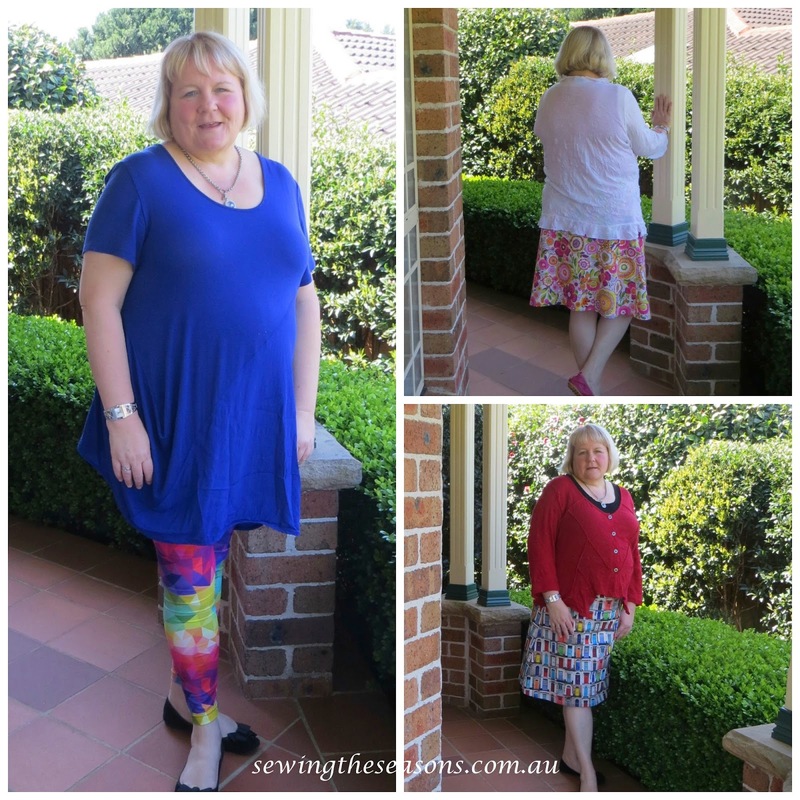 Both the leggings here are in spandex fabric from BooDesigns, an Australian company. Today's post is simply about me sharing my creations, is not part of a blog tour or pattern promotion, I just enjoy sharing the pattern and fabric sites I have discovered and enjoy using in the hope others will be encouraged to have a go at sewing for themselves or discover new designers. I also appreciate both these designers have a wide size range in their patterns. You have made gorgeous clothes for yourself. You must be thrilled.